A Preschool Staff Handbook is vital in any preschool or child care program. It helps to communicate the mission and overall purpose of your program. It clearly states the expectations of the staff. It will help to ensure that your entire team is on the same path to providing quality of care. Your handbook will have as many or as few sections as you need to convey this information. Let's look at the four main purposes for having a staff handbook. A written format to cover policies and procedures with regard to terms of employment for your staff. A printed format to cover policies and procedures with regard to expectations of staff within the program. A support tool to help with staff orientation, staff training and reinforcement of procedures or policies for your staff to refer to. A written "road-map" of where you want to go. The items in your handbook help promote quality of care by outlining the path each employee should be on. If you already have a preschool staff handbook, take some time away with your favorite beverage and read it again, objectively. Although YOU know what is meant by each section of your staff handbook, is it written in a way that new staff will understand it? Does it include early childhood "buzzwords" that may not be everyday language to all staff members? In our state, we use the words CORI and SORI. Not everyone uses these terms. They may have heard the term Criminal Record Check rather than CORI (Criminal Offense Record Information) or SORI (Criminal Sexual Offender Registry Information). Staff may not know that "all activities planned will be DAP" means that they will conform to Developmentally Appropriate Program standards based on NAEYC guidlines. For that matter, some staff may not know what NAEYC (National Association for the Education of Young Children) means! Provide detail and explanations for all buzzwords and acronyms in your staff handbook. Place buzzwords or acronyms in parenthesis after the description as I did above. Define early childhood buzzwords in your handbook. Many who are newer in the field may not know the acronyms. For example, do not state that "All lesson plans will be DAP according to NAEYC standards." Instead state, "All lesson plans must conform to the National Association for the Education of Young Children's (NAEYC) standard for Developmentally Appropriate Practice (DAP)." As you review your preschool staff handbook, ask yourself, "Do the policies and procedures still apply? Are any changes or additions necessary?" Are you looking for a Staff Handbook that is already written?? Look no further! 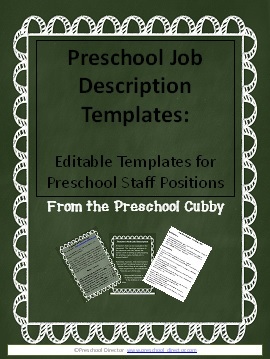 I've made MY Preschool Staff Handbook completely editable and available in my store. It has over 50 procedures and policies. You just need to edit it to reflect your own program's needs. Click Here or the picture to the left to read more! What your state licensing regulations and/or state laws require with regard to an employee manual or staff handbook. Some of these agencies DO have specific requirements for this. Others do not. How small or large your program is. "Please let me know at least 1 week in advance of any time off needs." In a larger group, you may need a paragraph or more to outline the limitations of time off. For example, based on staffing, you might limit time off to 2 staff members to be on vacation at the same time for the school age program and 3 staff members out at the same time in the preschool department. You will have to decide what you want to include in your preschool staff handbook taking the above items into consideration. Below I have listed many sections to consider. You might decide to use 3 sections or all of them, it will all depend on your program's needs and legal requirements. Many directors will add sections as needed, when it becomes clear there is confusion about how to handle certain issues (i.e. cell phone usage). It is always a work in progress and you should review your handbook each year. Let's get to it! Let's look at the many sections you might want to include! State the purpose of your preschool staff handbook and the instructions to read, ask questions, sign and date the signature page, and return to you. A "Welcome to Our Program Letter"
Provide a table of contents which lists all items in the order they will appear in your preschool staff handbook. Looking for an editable job description list? Click Here to Check It Out! Staff Hire Requirements Include requirements staff must follow or complete in order to be employed at your program. This might include Criminal Offense Record Information check, Sexual Offender Registry Information Check, annual health form and physical, in service trainings, completion of a W4 and I9 form, remain current in 1st Aid and CPR, etc. List job descriptions for EVERY staff position you employ: aides, assistants, lead teachers, secretary, etc.). I have an editable job description list that will save you so much time! Click here to learn more. If you have a range for each position you might list that range. I include each pay range within each job description. List your policy on these areas: Securing a qualified replacement (if that is your policy); Who and how to contact when a staff member is going to be late and/or absent; if time off is paid or unpaid and if you have a policy of suspension and/or termination for excessive tardiness and/or absenses. List your expectations and policies with regard to each of these such as immediate termination for alcohol use during work hours; state that prescription or over the counter medications must not impair staff member's ability to carry out their jobs; state location requirements for the storage of prescription and over the counter meds in the program, etc. Note: If staff have medication in their handbags or backpacks, are they (the handbags and backpacks) in a secured area where children will not have access? Do you offer benefits? List any paid sick time, vacation, etc. Is paid time for part time staff, full time? In this day and age, you may want to consider placing this in your preschool staff handbook if it is not already there. I can not tell you how many times I walk into a program and see teachers texting each other (to teachers in the other room but also to their coworker across the room!). List your policy, either no cell-phone usage in classroom, phones on vibrate at all times, etc. This is a technology that is here to stay. Many are used to checking their phones for social media posts, text messaging, etc. on an hourly, if not more often, basis. This is, in my opinion, a distraction in the classroom. Each staff member needs to be focused on the children while in the classroom. My policy is a no cell phone policy. I do not want staff members looking at their phones every 5 minutes (And yes, this does happen!). If they are expecting an emergency call, they need to have the person calling dial into the program directly. You will need to write up your policy according to your requirements. Be clear on what you expect (i.e. staff shirts, specific colors of pants/skirts, type of footwear) as well as what you do not allow (i.e. open toe shoes; undergarments showing; low-cut shirts, blouses). Who should a staff member go to with a complaint or grievance? Provide contact names and telephone numbers. If the grievance is about YOU (yup, that happens, too! ), is there a Board of Directors or are you the owner/operator? Your policy may be for the staff member to meet directly with you first. The next step would be to contact the owner/operator or preschool board member? Express your open door policy and be open to hearing concerns! This is typically a policy that you do not discriminate in hiring based on age, gender, etc. Check your state labor board for information on what to include in your preschool staff handbook. Explain how hours are recorded (sign in/out form; time sheet; computer check-in system, time clock, etc. ); how often and when paychecks are issued (i.e. every two weeks, on Thursdays); how and where to pick up paychecks, how to apply for direct deposit, etc. Discuss if there are any paid sick or vacation days; how to request time off (in writing? 1 week in advance? ); are inclement weather closures paid? Are holidays and school vacations paid? Include your policy on Jury Duty, Bereavement; Military Leave; Personal time off, etc. Like the non-discrimination policy, this is a pretty standard policy to have in place. It can be as short or lengthy as you deem necessary for your program. It will typically include a description of what sexual harassment is, how to respond to it and how to report it. List if you are a smoke-free campus; if you provide a smoking area, list where it is located. Describe your disciplinary process in detail (discussion, written warning, etc.) or a brief description of what would warrant disciplinary action (excessive tardiness, absenteeism, failure to perform duties of job, etc. Do You Wish Your Staff Handbook Was Already Written??? I know how you feel! And, I have created one you might be interested in! It's completely EDITABLE and it is affordable! In this section of your preschool staff handbook, include all items that are specifically related to staff intereactions with the children, the families and classroom related items. I have listed below items you might want to include with a brief description of each. List all tools used and how often they are to be used. Weekly, monthly observations and forms; bi-annual progress reports; collection of portfolio work, what to consider while assessing etc. List your program's philosophy with regard to child behavior guidance such as redirection, helping children develop problem solving techniques, time-away. Also, use this area to describe what is NOT acceptable such as corporal punishment (detail what that is and refer to state guidelines if in your state regulations as well); sending children to "the office"; time-out, etc. Detail your child pick-up procedure. Do parents sign their children out or are they released by the staff? Staff needs to be aware of who is authorized to pick up; they must ask for identification to confirm if they are not familiar with the person picking up; etc. If an alternate person is picking up, must be in writing? Contact teacher? How do staff purchase items needed for the classroom? Do they submit a request to the director? If so, is there a specific form? Is there a deadline date for supply requests? Are they authorized to purchase and submit receipt for reimbursement? What is their authorized spending limit? Be clear on this information. A teacher may request items for a science activity they want to do. However, if they do not submit this to you until the day before they want to carry out the activity, you could be on the run and shopping on a daily basis! Include policy regarding personal information of co-workers; regarding child and family information sharing (should be shared on a need to know basis); not discussing a child or family in front of other children or families, etc. Do you purchase a curriculum program? Does your staff plan their own themes and activities? Who, specifically, is responsible for the planning for each classroom? What should planning include (math, science, etc.)? Is planning done based on preschool themes? If you are a Christian program, what are your expectations regarding Bible stories and activities? Provide a copy of the planning form you utilize and list dates you expect the plans to be submitted to you. If weekly plans are to be posted in the classroom, state where they are to be posted. Include information about your procedures such as where diaper changes happens; how to dispose of diapers; and who provides diapers and wipes. With regard to toileting include items such as your policy on how much you will help a child who needs help in the bathroom, the type of help you will provide, how toilet training is supported, how to store soiled clothing, etc. Also include any state regulation information regarding toileting such as: children are not required to be toilet trained in order to be enrolled, children are not to be degraded in any way for toileting accidents, etc. Have detailed information about every type of emergency procedure your program may need. It should include details for a Fire Emergency, Lockdown Emergency and Shelter in Place Emergency at the minimum. In areas where tornadoes or hurricanes are prevelant, include details for your procedures for these. For information on how to set up a safe procedure for any of these areas in your program, contact your local fire or police department and/or local FEMA group (Federal Emergency Management Association). List any policies regarding off-site trips and on-site visitors. Advance planning is extremely important to ensure the safety of the children and the success of the trip or visitor. Provide any forms you use for this planning including transportation, prior approval by director, etc. Does your program have a delayed opening when the local public school does? Do you close on public school delays/closings? If program closes due to weather, how are staff and family notified? What if you are open in inclement weather but a staff member can not make it in? 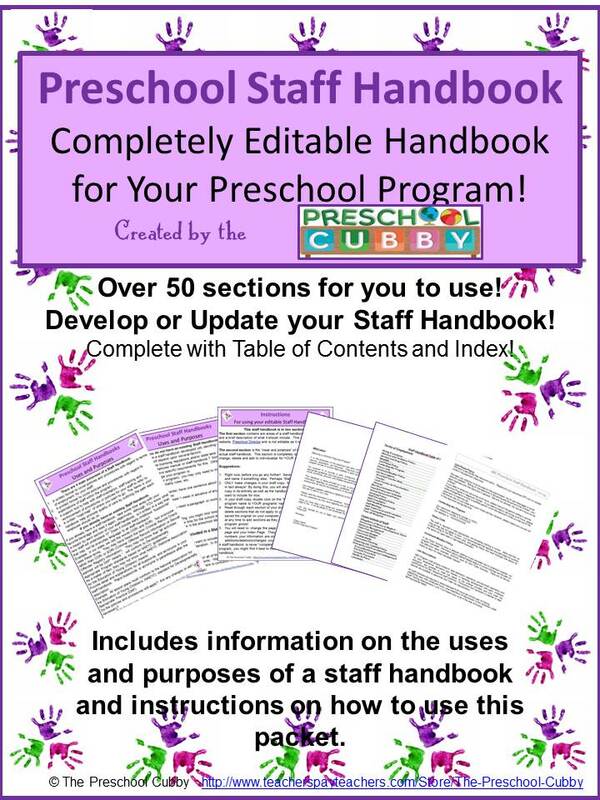 If you are looking to save a lot of time developing your preschool staff handbook, take advantage of my years of work! This is a completely editable hanbooks with all of the sections discussed on this page. You simply reword as you'd like, delete policies that do not apply to your program (or add what you'd like), individualize it to your program and print. Include your Medication Policy: Who is authorized? Where are meds kept? What is the procedure for accidents in your program? Most state licensing divisions have an incident/accident report to use. If not, create one! What needs to be reported? I suggest that if any first aid is supplied, an incident report is completed and parent is notified. Yes, for every band-aid! Parents need to know. What may seem like a little scratch now could become a bruise or infected area of the weekend. Notifiy parents of every incident. The same for staff. If a staff member falls or gets hurt, fill out an incident report. Include Sick Child Policy in this section of your preschool staff handbook as well. This is where you would list your procedure for exlusion of children with illness. Most state licensing divisions have a list. It typically includes temperature over 101; vomiting; diarhea; not to return until fever free for 24 hours without the aid of a fever reducer. Also, list how children who become ill while in the program are supported: In a comfortable area, away from other children, until picked up; who contacts parent, etc. Most states have a specific definition of abuse and neglect as well as a REQUIREMENT that you include it and contact information to your staff. Include your area's laws, name of reporting agency, reporting phone numbers, etc. Do you have daily or weekly communication forms? Does each classroom have a whiteboard to use for daily communication? Discuss them here and provide samples. Are there parent conferences annually or bi-annually? Meeting with Parents with Concerns: What is your protocol? Staff meets with you to discuss issue, work together on plan. Do they contact parent? Do you? ----->An aside......This is something I feel very strongly about. Please discuss what, how and who should relay information with parents. We want all of our staff to be empowered, however, it might not be appropriate for your teacher's aid or substitute to discuss a child's behavior with a parent. What that staff members sees as "bad behavior" may be typical preschool behavior, such as learning how to problem solve. Does each class have a monthly newsletter? Does the staff prepare them? Does the staff provide classroom information to you for the newsletter? What are the deadline dates? Include where naps happen, how to set up (mats and/or bedding from home, do you supply them?). What is the policy for your children who do not sleep? What is the nap room supervision schedule and what are the expectations? Include who provides snacks and meals (parents or your program); what foods are not allowed due to allergies, who checks for that, who shops for snack/food items, etc. Do you allow ipads, tablets etc. in the classroom for use by the children? Do you have a computer in the classroom? What types of programs or apps are authorized? Do they need to meet with the director before using apps or software in the classroom? You may have a policy where there must always be one staff member at the bottom of a slide and one at the steps of a slide; you may require that there always be a staff member supervising the swings; I suggest stating a "non-congregating" policy for the staff. You know what I mean....staff all chat in a group while children play rather than interacting with the children. Sanitation and rotation of materials (is there a cleaning list? ); Daily checklist of what should be done before closing up the classroom (chairs on tables? vaccuum, unless you have a cleaning company that does that); take out trash? Do you have formal days throughout the year for a classroom clean up with the team? Who checks for toy safety (broken toys, recalled toys, etc.)? List your program's policy with regard to children's pictures on the internet as well as internal use. Most programs have a photography release form. This form should also include a permission request with regard to photographs being used on Facebook or your website. This is an area to consider each year. If you have a child who is in foster care, the foster parent will not want the child's picture to be used on any information that might leave the building (including a classroom newsletter). You may need to have a strict "no photographs" policy across the board in this case. This includes parents taking pictures of other children in the classroom. Our form has had 2 permission request areas: 1 for internal use pictures (classroom calendars, in class use-such as name tags- and newsletters. The other permission request is for permission to use photographs on the school website, Facebook page or other site. We have, over the years, had parents who approve the first but not the website/Facebook permission. They do not want their child's picture on the web, and that is their right and YOUR responsibility to comply with. This can be challenging when you have parents in the classroom taking pictures of their child who is playing with a child whose parent does not want the pictures on the web. We have run into this each year. We let parents know at the beginning of the year that they are welcome to take pictures of their own children, however, they may NOT take pictures of other children in the program, for safety and security reasons. It has not been a problem so far, but this is something for you to look at and consider each year. How often are staff evaluated and by whom? I highly recomend providing your staff with a copy of the evaluation form that will be used. This helps ensure they are focusing on improvement in the areas they are to be evaluated on. List all forms and processes in this section of your preschool staff handbook as well. List when staff orientations take place and the requirement. For example, we have a new staff orientation as well as an annual staff orientation. All staff are required to attend the annual orientation regardless of how long they have been with the program. List when staff meetings are held. Are they mandatory? Are staff members also expected to have team or in-class weekly or monthly meetings? Let staff know the state/county requirements for annual staff training and which trainings qualify to meet the requirements. ( I have online in-service trainings that qualify in many states. Click Here to see them). Most states have a set number of hours staff must receive per year. In addition, some states have specific requirments about the type of training that qualifies. I suggest also listing that any training, even if approved by the state, must be reviewed by you prior to the staff enrolling. This will help you to ensure that the staff are enrolling in training that will be beneficial to their classroom as well as their individual professional development. List when children move from one classroom to the next (i.e. from the toddler room to the preschool room)- Is it based on age? Developmental readiness? Be clear about who may or may not stay in the classroom to help. Do you have a volunteer policy ? If not, I highly recommend one. Does your state require criminal record checks on volunteers? Provide an alphabetical index for easier use of your preschool staff handbook. 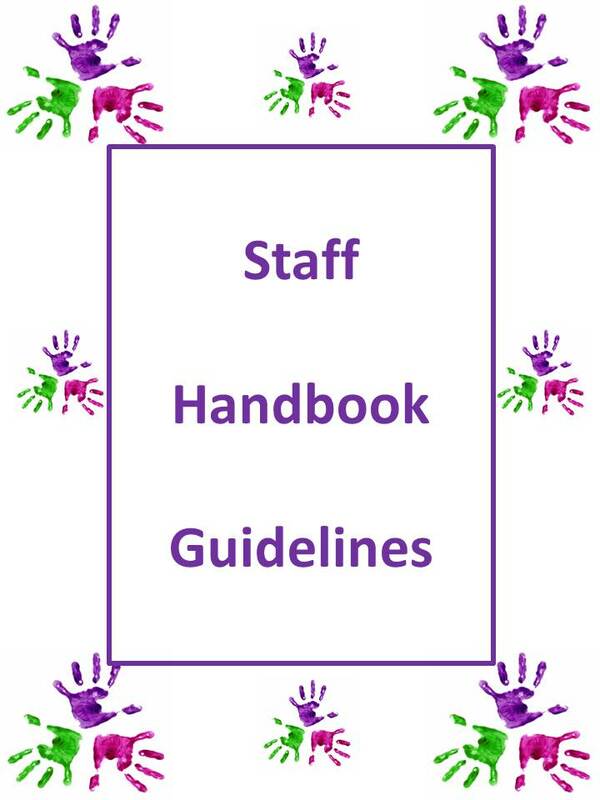 Read, sign and date the preschool staff handbook upon hire. Read, sign and date the preschool staff handbook each year at a staff orientation. Read, sign and date any changes or additions to the preschool staff handbook througout the year. Why "read, sign and date"? You have, or will be, putting a lot of time and work into your program's handbbook in order to have your staff all "on the same page" when it comes to the program. There may be a lot of information in your preschool staff handbook. It is important that each staff member read and understand the policies and have the option to ask questions about items they do not understand. It is also important that staff members are aware of any changes to policy that happen. This is especially challenging in a larger program. It is therefore important that you give each employee ample time during work time or upon hire to read it on the premises. Signing and dating commits the staff member to take responsibility to read it and ask those questions before signing it. In a larger program you might circulate, as a program director did at a large center I worked for, a clipboard that has a printing out copy of the change or addition and a printed list of all employees names. On the names list, you state "please read, sign and date. If you have any questions or concerns about this policy change, please see me before signing. Please pass clipboard on to the next team member on the list." Once you have the clipboard back, you simply place a copy of the signature page in each staff member's file AND make a copy of the policy change or addition to give each staff member a hard copy to add to their own copy of the preschool staff handbook. "I don't remember you telling me that." "I thought we were supposed to..."
"There's so much in that staff handbook, I didn't have time to read it all." Your preschool staff handbook can also be put to use at staff orientations! Use it as an agenda. Highlight the most important topics you want to cover at the orientation and have some lively discussions of examples of that step in action. You might also consider using your preschool staff handbook as a catylist for staff trainings or classroom or staff meetings: Do this by focusing on one topic from the handbook at a meeting such as: Classroom Safety and Sanitizing toys; Behavior Guidance Policy, etc. A Staff Handbook, though important, will never replace face to face communication! Your communications, however, should support your policies! Dont' create a handbook just to create one! Even if you are REQUIRED by law to create one, make it meaningful and one that helps you run a wonderful program as a team by stating the goals, missions and expectations of all who work in your program! Go to the Staff Main Page for More Articles!